We all know that the kidney is a very important organ to the body just like the heart is. The basic functions are that it helps to filter unwanted products from getting into the blood. If you notice any of the signs listed below I fear it may be as a result of kidney failure. Every day our minds process tons of information, our bodies perform thousands of actions. Living in this busy world makes it very easy to miss some messages that your body sends you. And the consequences of not communicating and responding to these signals can be drastic. Bright Side made a list of signs which indicate that your kidneys are not working properly. How many of these signals have your body been sending to you? Healthy kidneys do tremendous work by removing waste and extra fluid from the blood, helping produce red blood cells, and maintaining the proper amount of minerals in your body. Itchy and dry skin signal the failure of kidneys to maintain the right balance of minerals and nutrients which can result in bone and kidney disease. Caution: If you have dry and itchy skin, try to stay more hydrated. Remember, before taking any medication for itching consult your doctor. Certain medications have ingredients that potentially could damage your kidney function even more. Healthy and properly functioning kidneys convert Vitamin D in our bodies to maintain strong bones and to produce a hormone called Erythropoietin (EPO). This hormone plays an important role in the production of red blood cells. When kidneys don’t function properly, they produce less EPO. The decline of red blood cells (those that carry oxygen) results in rapid fatigue of your muscles and brain. Caution: It is common for people with Chronic Kidney Disease to have anemia. Anemia might start to evolve when someone has 20% to 50% of normal kidney function. If you’re getting enough rest and sleep, but continue experiencing feelings of tiredness, low energy levels and general weakness, you should visit your doctor without delay. 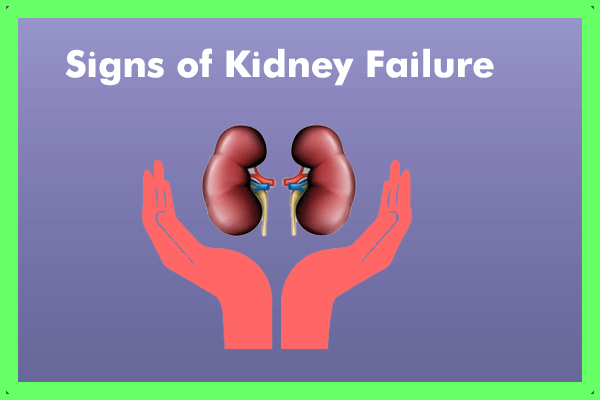 When your kidneys are not functioning properly, it means that toxins cannot exit the body through urine and remain in the blood. Increased level of toxins makes it hard to fall asleep. That’s why when you get less sleep, you increase the chances of kidney function decline. Caution: People with Chronic Kidney Disease more commonly suffer from sleep apnea. Sleep apnea is a disorder that causes one or more pauses in the breath when you sleep. These pauses can last from a couple of seconds to a minute. After each pause, normal breathing returns with a loud snort. Continuous heavy snoring signals that it is time to see a doctor. When waste builds up in the blood, it changes the taste of food and leaves a metallic taste in your mouth. Having bad breath is another sign of having too many toxins and contamination in the bloodstream. Furthermore, you may stop wanting meat and lose your appetite in general, which can lead to unhealthy weight loss. Caution: There are various reasons why food can have a metallic taste (from allergies to poor oral health). Normally, the metallic taste in your mouth should go away if the assumed cause has been treated. If the taste continues to appear, you should contact your doctor. The relation between kidney disease and experiencing shortness of breath, especially after little effort, is caused by two factors. First, extra fluid in the body moves into the lungs when kidneys are not functioning properly. Second, anemia deprives your body of oxygen and this results in shortness of breath. Caution: There are various reasons for breath shortness from kidney failure to asthma and lung cancer or heart failure. If you notice that you are constantly out of breath after putting forth very little effort, you should contact your doctor immediately. Kidneys that are failing to perform properly don’t remove any extra fluid from the body. This leads to sodium retention which causes swelling in your ankles, feet and hands. Swelling of the lower parts of your body can also signal heart and liver disease or leg vein problems. Caution: Sometimes taking medication, reducing salt and removing excess fluid in your body can stop swelling. If it doesn’t help, then you need a separate treatment. Kidney failure can result in back pain that is usually deep and located right below the rib cage. It can be felt in the front of the groin or hip area. Back and leg pain can be caused by kidney cysts, which are large fluid-filled sacs formed on the kidneys, and are the result of polycystic kidney disease. Tip: Back pain caused by kidney failure is accompanied by feeling sick, vomiting, high body temperature and frequent urinating. Normal back pain that has no correlation with the kidneys behaves differently: pain is more localized and happens suddenly, there is no fever. If you keep experiencing back pain and pain relief pills are ineffective, make sure you see your doctor. An early sign that your kidney’s filter system is damaged is the onset of protein in the urine, which can result in puffiness around the eye area. The puffiness around your eye can be explained by the fact that your kidneys are leaking a large amount of protein into the urine rather than keeping it and distributing it throughout the body. Tip: If you’re sure that your body is receiving enough rest and protein, but you continue to notice puffiness around your eyes, make sure to schedule an appointment to see your doctor. Your circulatory system and kidneys depend on each other. The kidneys have small nephrons that filter waste and extra fluids from the blood. If the blood vessels get damaged, the nephrons that filter your blood don’t receive enough oxygen and nutrients. That’s why high blood pressure is the second leading cause of kidney failure. Tip: Learn to manage your high blood pressure to avoid kidney failure. Add foods rich in folic acid as it is engaged in the production of red blood cells and can help prevent anemia. Increased need to urinate, especially during the night. Anywhere between 4 to 10 times a day is considered to be normal. Seeing blood in urine. Healthy kidneys filter waste from the blood to produce urine, but if the filter is damaged the blood cells might start to “leek” out into the urine.